“Less than 35 years” means about age 30. “35 to 44 years” means about age 39. “45 to 54 years” means about age 49. “55 to 64 years” means about age 59. “65 to 69 years” means about age 67. “70 to 74 years” means about age 72. “75 and over” means about age 78. 21% annually while the head of household is in the 30s. 8% annually while in the 40s. 4% annually while in the 50s. 2% annually on the cusp of retirement (early through middle 60s). 1% annually during early retirement. -3% annually in later retirement. Illiquid home equity is generally a major component of total net worth. 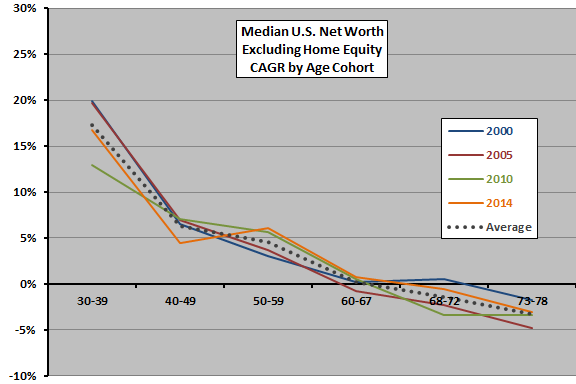 What happens when we exclude home equity from net worth? 17% annually while the head of household is in the 30s. 6% annually while in the 40s. 5% annually while in the 50s. 0% annually on the cusp of retirement (early through middle 60s). -1% annually during early retirement. In summary, evidence from U.S. Census Bureau data suggests that individuals must maintain net worth growth rates materially higher than those indicated above to achieve/maintain exceptional wealth. Modeling methods are crude, so findings are notional. Quality of data is unknown, perhaps impounding biases in sampling and statistical interpretation. 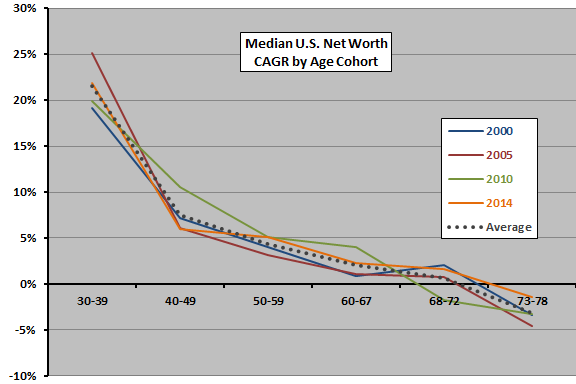 This analysis is related to retirement planning research.